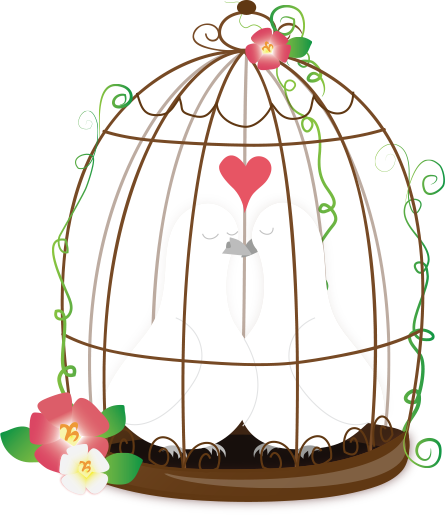 Two very dear friends celebrated their 50th Wedding Anniversary recently, and I made a card for them. 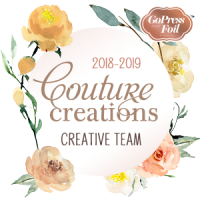 I started by creating an easel card. This is done by folding your card into half, as you would normally do, then fold the front into half again. 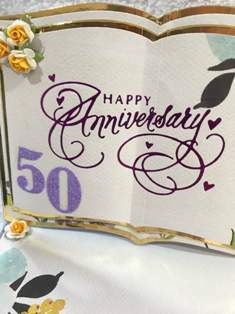 Using Le Petit Jardin design paper, as well as the Happy Anniversary Hotfoil Stamp, I foiled the greeting onto the paper I was going to use for the front of the card. To get the shapes for the ‘book card’ I used a die made for this purpose. As you can see from the photograph, there are several layers to this. 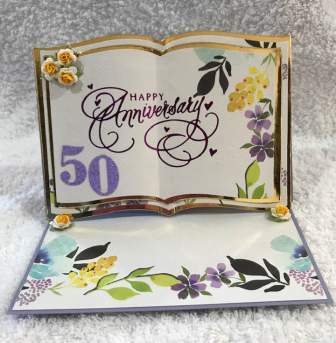 Once I’d foiled my card, I added “50” using dies and glitter paper, then added some matching flowers to the top left hand side. Above is the finished card. It was a little fiddly to make, but totally worth it. My friends absolutely loved it, along with the envelope card, which I had made a short while ago to go along with this card. Simply BEAUTIFUL Cheryl. Stunning as a easel card. Ina Grehan recently posted..What’s this weeks ‘WORD’ at Just Us Girls? This is so very gorgeous and elegant looking with those colorful flowers and the gold frame. 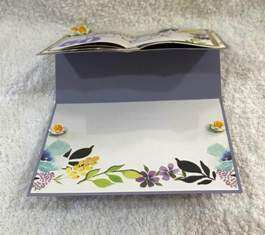 Beautiful used as an easel card design too. Thanks so much, Ina and Verna!